Lead Story: There comes a point when you have to throw your hands up and give credit where it&apos;s due. 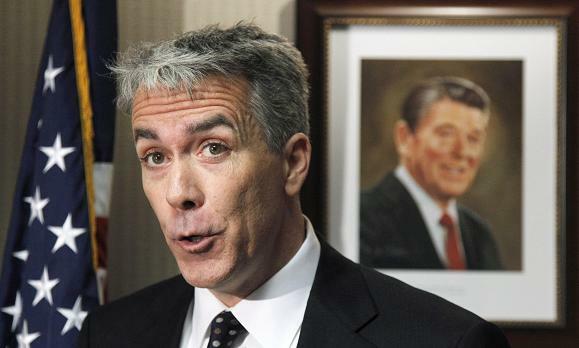 So today, I give credit to Illinois’ Crazy Uncle™, U.S. Rep. Joe Walsh. Sure, I’ve gotten riled up about the outlandish things Crazy Uncle Joe has said in the past, but with his latest volley? Telling Sandra Fluke to “get a job”? Taking another potshot at his opponent, Iraq War veteran Tammy Duckworth, by saying she only cares about her outfit? You, sir, are nothing if not the most consistent candidate out there. You know when to say when and not simply stoop to, “Women love shopping, am I right, fellas? That and staying barefoot and pregnant in the kitchen!” You may be misogynistic and racist, but don’t let anyone ever tell you you’re a flip-flopper. Also: Hey, it’s Illinois’ other Crazy Uncle Joe, Cook County Assessor Joe Berrios, and this time he’s got a huge tax bill for his constituents because he’s above ethics laws. Back in 2010 after he won re-election for his spot, Berrios added his sister and his son to his payroll and has since claimed it’s totally OK because ethics laws don’t apply to some elected officials like him. Like with Walsh, I have to give Berrios credit for having the balls to say, “Yeah, I did it, but it’s totally OK!” Berrios, who is also the Cook County Democratic Party chairman, hired a private lawyer to fight the charges and, you guessed it, that bill is being footed by taxpayers, according to the Sun-Times. Berrios also has a daughter on his payroll (who hasn’t come under scrutiny yet), and another daughter who just barely won her state rep seat primary this spring. Illinois: The Clout State. And then: In the wake of the teachers’ strike, many local media outlets dug up a story from over the summer that seems all the more appropriate now: Mayor Rahm Emanuel’s decision to send his own kids to the private University of Chicago Lab Schools. That action by itself shouldn’t stir much trouble for the mayor. But the tenor of that decision has changed dramatically, at least in the eyes of the media, now that the public school strike and Emanuel’s attitude towards the CTU are making national headlines. RIP: Ron Taylor, renowned Australian marine conservationist who helped with the filming of Jaws, at the age of 78. Taylor and his wife shot some footage of great white sharks later used by director Steven Spielberg in his legendary film. According to family members, Taylor and other shark-lovers often felt conflicted about their role in the film which terrified swimmers and beachgoers and portrayed the sharks as monsters. Authorities have released video of the deadly August shooting at a Sikh temple in Wisconsin. While Mitt Romney barely got any movement out of his convention, early indicators are that President Obama got at least a small bump in the polls out of his, something reflected on the continually excellent reports from Nate Silver. Speaking of Obama, the pizza shop owner who is responsible for the second-greatest photo of this election year (the best goes to, of course, Joe Biden) is now feeling the Republican backlash. Here’s MC Hammer standing on a food truck barge and handing out grilled cheese sandwiches to kayakers. Our own Linda Lutton continues to get the latest look behind the CTU strike, now in its second day. And you thought we were done with Blago! The Sun-Times’ Natasha Korecki, one of the best reporters in Chicago (non-WBEZ category, of course), has released a book about the Rod Blagojevich trial (ebook edition, $5!) in which she alleges Rep. Jesse Jackson, Jr. tried to arrange a pardon for Blagojevich Blag via President Obama. Boom! Would you like to look at the 171 TIF projects the city authorized from January 2000 through July 30, 2010? Of course you would. So go to this amazing website. Work continues on the north end of the Red Line with the Clark/Division stop getting a face-lift. Speaking of construction, the Reader’s Deanna Isaacs has a fantastic read on the ongoing Prentice Women&apos;s Hospital saga. Another victim of the teachers strike: Chicago Public Schools sports teams. The White Sox got a huge win over the Detroit Tigers last night, a good start to a four-game series that may go a long way to determining the AL Central champ. The Pale Hose now lead the Tigers by three games. Bears fans: Please be quieter when the Bears are in the red zone. Thanks. Love, Jay Cutler. The NFL has reportedly signed on those replacement refs through at least week five of the regular season. On Sunday, the Redskins beat my beloved Saints. Even more impressive: the Redskins’ long-snapper played the entire second half with a broken arm. The first teaser for Steven Spielberg’s film Lincoln, starring Daniel Day-Lewis as the titular president, is out… and advertises the premiere of the film’s first full trailer on Thursday. Weird. But whatever. This film is going to win all the awards.